Don’t believe us? Ask Anand Bosmia, a graduate student of the University of Alabama School of Medicine who authored a study about, you guessed it, vodka eyeballing. I have an interest in researching oddball topics that haven’t been written about. I’d written about the cinnamon challenge in the same journal. Also, physicians are always concerned about trauma in young people as a result of their recklessness, mainly because it’s behavior that they find confounding. Why do you think college students believe vodka eyeballing gets them drunk more quickly? Their argument is that because they’re pouring the alcohol so close to an area heavy in blood vessels, it gets into their system more quickly. But in my article I argue that the reason they believe the method works so well is because they may have already been very drunk by the time they do such a reckless act. Basically, they’re contributing too much credit to vodka eyeballing as a means to get drunk quickly. Does it actually work at all? 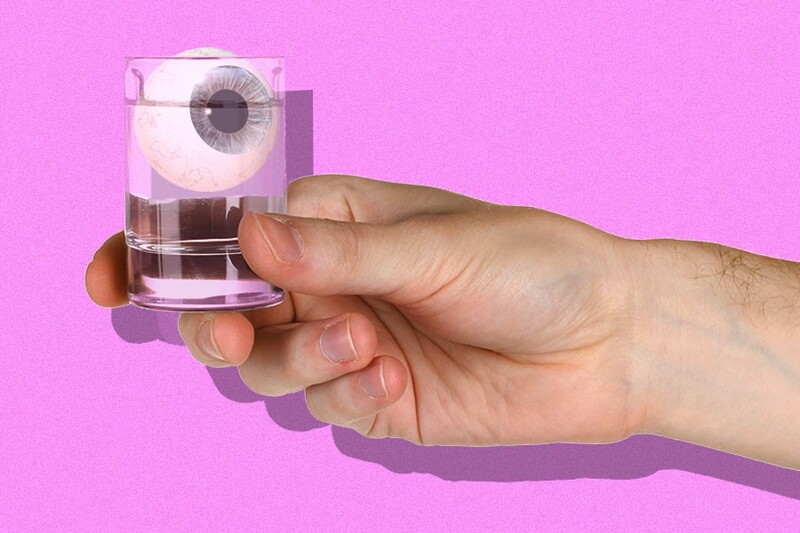 What does pouring alcohol into your eye actually do to your eyes? Given that alcohol can be very corrosive, it can cause corneal abrasions and scarring. Because the tissues in the eye are being injured, it can promote the growth of new blood vessels to promote healing. The problem is that if you have too much growth, it can worsen the scarring and that’s what causes a loss of vision. Also, because you’re destroying that tissue, it can increase risk of infections in the eye. How many times would you have to try pouring liquor into your eyes before you caused serious damage? It wouldn’t happen after the first time — it would have to be chronic use — but I don’t have an exact estimate of how many times it would take to cause permanent damage. It does, however, depend on how much alcohol you pour down at one time. I guess in that way, if you were to pour an entire bottle of vodka through your eye in one sitting, that would likely cause permanent damage. Is there any way to reverse the damage? I’ve never treated anyone with this particular injury. The best way to address it, if swelling and sudden vision loss develops, is to take them straight to the emergency room. When concerned about corneal abrasion, emergency physicians will pour fluorescence dye into the eye and expose it to a wood lamp to diagnose it. If surgical intervention is needed, they may need to have ophthalmology consulted. Have you ever tried pouring alcohol into your eye?